Today, with the power of steel to share with you building sheet piles should be noted that what the contents of the pile. 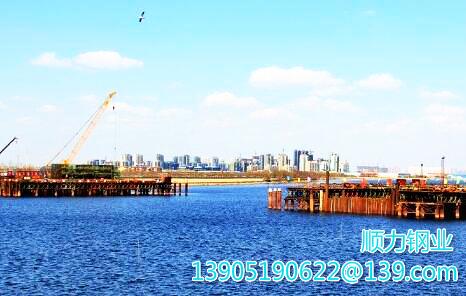 sheet piles encircling is generally used in large water depth construction environment, it is used to locate and support the sheet piles. In the construction site to locate the pile before the fight, the first land or shore to install the installation of the prison, and then transported to the construction pier position. After the pile is fixed on the positioning pile, the sheet piles is guided into the sheet piles. In the installation of the money we have to pay attention to go after the first measurement to determine the positioning pile, first into the positioning pile, in its guide frame installed. Guide frame installed on the land, and then transported to the specified location cable. Should have been inserted into the sheet piles hanging guide frame. The guide frame can be mounted on an external rotary piling frame. For floating carousel, the guide frame before the installation of the pile with a rotating pile to lay the pile. Friends of the construction of sheet piles around the prisoners there are any other questions, please contact us with the force of steel industry. We will have a professional engineer for you Q & A FAQ. Also welcomed the domestic engineering and I Secretary for cooperation in business negotiations. Shun Steel will certainly provide you with the most cost-effective products and construction solutions.